Skill level: Novice. Be sure to follow instructions. This is a time-consuming recipe! Soak the chickpeas in 8 cups of water for 12 hours. (I would soak mine in a mix of water and vegetable stock). Drain and rinse thoroughly. 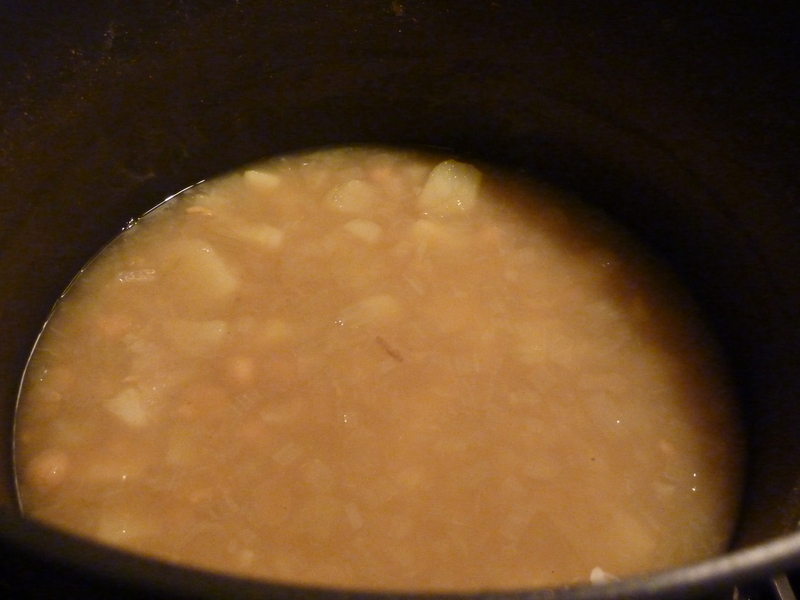 Put the chickpeas, onions, and 8 cups water (stock) into a large pot and bring to a boil. Cover partially, turn heat to low, and simmer gently for 1 hour. Add potatoes, salt, turmeric, cumin, coriander, cayenne, and another 3/4 cup water. Bring to a boil. Cover and simmer on very low heat for another 1 1/2 hours. Stir a few times during this period. Check seasonings. Add the black pepper and lemon juice. Stir to mix. This was a HUGE hit with my husband. It does require a bit of planning, but the end result was pretty fantastic. We were able to dine on this soup for almost a full week and it only got tastier the longer it aged.